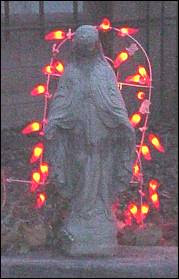 ...you put red chile lights around your Blessed Virgin Mary! Oy, who'd have thought -- enrollment is looking very good at my Introduction to Bead Embroidery Class at the Harwood Art School. There are only a few slots left, which just made me realize -- I have a lot of kits to make up! I like that the Harwood was willing to offer some beadwork classes mixed in with their usual program of fine arts offerings. I decided to let students choose between two projects in the first class -- one a spirit doll pin, and the other a mirror to hold in your hand or hang on the wall. Both offer opportunities to stitch with beads, without being overwhelming for the beginner. With the mirror, especially, students will be able to bead a lot or just a little. Now...to make up a sample or two! Nuff for now. I just found bad code in my links and I'm supposed to be getting ready for the last day of Fiber Arts Fiesta! I suppose I should post something here to make it all official-like. I started this blogspot blog because, well, blogging on eBay has certain restrictions, like mentioning my new Etsy shop (hint, hint...check out the links folks). Not to mention the odd bloggish culture there -- people seem to think it's a live chat or something. So yeah. Also, I just signed up for Robin Atkins' Bead Journal project. We will make a beaded journal page each month for a year. I have a few goals and dreams to focus on, but eh, more about that later, chicas and chamacos. <--how do you spell chamacos? Anyway, back to Robin and the BJP. 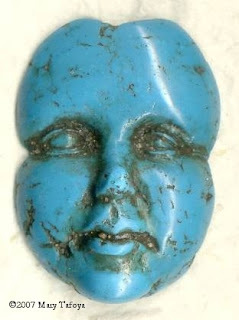 She has a rich blog called Bead Lust, read all about it there. And her website is pretty kickin' too!